Daily Illuminator: Get Off The Beaten Path! June 3, 2013: Get Off The Beaten Path! Hey, Car Wars duellists! Do you feel the need to stay with sufficiently asphalted arenas and roads? Don't be a stick in the mud . . . get stuck in the mud! 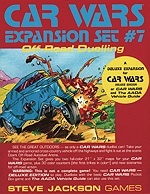 With Car Wars Expansion Set 7 - Off-Road Duelling -- newly released to e23 -- you'll get all the details of the Ozark Off-Road Autoduel Arena. As the arena's name implies, at this vehicular venue you'll push the limits of your car's suspension as you subject it to unpaved punishment. This supplement includes two oversized full-color maps (in original and printer-friendly pre-cropped formats), 30 counters, and two pages of details on the arena. Buckle into your five-point harness, make sure your windshield wipers are working, and head for the hills!